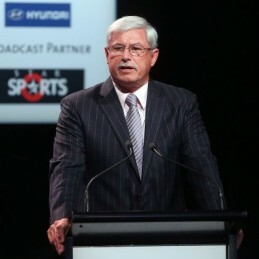 Sir Richard Hadlee is a legend of World Cricket. He made his first-class debut in 1971, as a replacement for his injured brother Dale, taking a hat trick. Richard made his Test debut the following year and in 1973 his 7 wickets would help New Zealand to their first Test victory over Australia. Richard Hadlee was a left-handed batsman but right-arm bowler who cemented his place in the New Zealand Test team in the 1975/76 season when he led the team to victory over India by taking 7-23 in their second innings. Richard would take ten or more wickets a further nine times. Over 86 Tests for New Zealand he would score 3124 runs at an average of 27.16 and take 431 wickets at 22.29. His one-day career would see him play 115 matches scoring 1751 runs at 21.61 and taking 158 wickets at 21.56. Perhaps his best performance was taking 9-52 against Australia in the 1985/86 season. In 1981 Richard Hadlee was awarded an MBE for services to New Zealand cricket and was further honoured in 1990 with the accolade of Knighthood for his services to cricket. Richard has written several books focusing on cricket tales with titles including: Soft Deliveries, Hard Knocks, Caught Out, Howzat – Tales from the Boundary and an informative book on the fundamentals of the game; Hadlee on Cricket. An inspiring, entertaining and articular speaker, Richard Hadlee is currently an ambassador for the Bank of New Zealand. Sir Richard Hadlee lives by the motto “A quitter never wins and a winner never quits” and is a firm believer in always trying your best.